Guadalupe River on a morning with rain squalls in San Jose. Rain showers. This was one of those days when you were glad you brought along your Showers Pass rain jacket (I charge them for every time I mention their brand. The problem is collecting.) 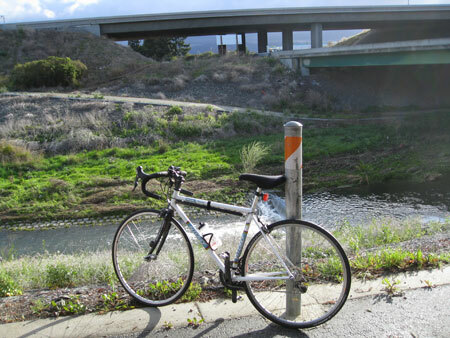 The mighty Guadalupe River flows under Highway 880 near the San Jose airport. I wonder why that path on the other side of the river was built? Was it ever open? This entry was posted on March 18, 2012 at 10:49 am and is filed under News. You can follow any responses to this entry through the RSS 2.0 feed. You can leave a response, or trackback from your own site.